After completing the lululemon/strava run challenge on Sunday, I dialed back my miles. It's nice to be "just" running again. Between some personal stress and our new president, I need my runs to help me sort things out. There is some prep work to do as I gear up for marathon training in March, but for now, I just get to run. I've got some mental fitness to work on and it's nice to have the freedom to do that. No gears, no heart rate training, no goal paces. I've got it on cruise control. I can hardly believe it's the end of January, but yep, there it is! And just in time for Runfessions. I've been saving them up and I have a few...nothing too earthshattering, which in my book is a good thing! Pull up a chair and have an anti-inflammatory smoothie. This one's got cocoa, blueberries, banana, avocado, cinnamon, and oatmeal! 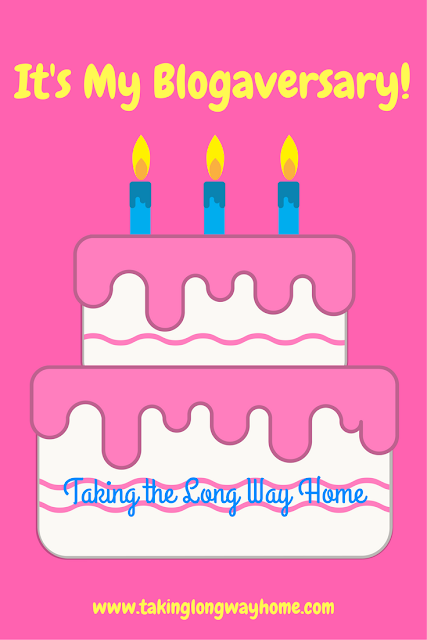 Taking the Long Way Home is 3 years old! 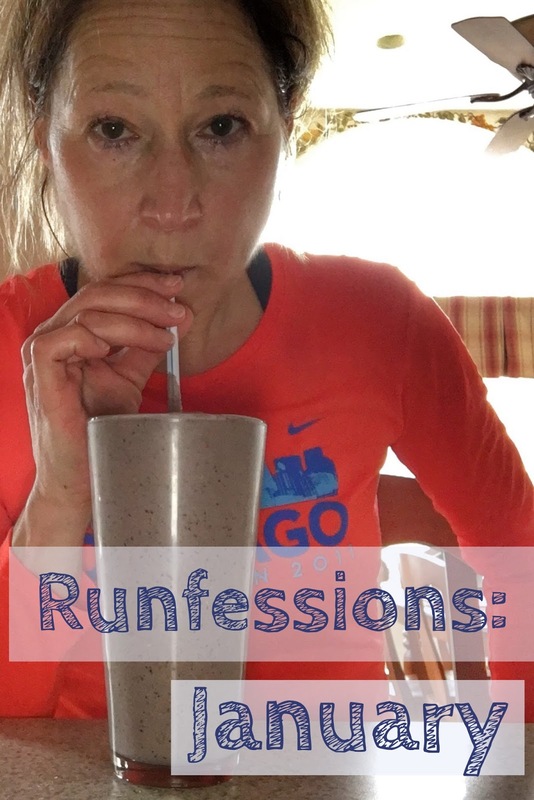 Today's Tuesday's on the Run topic is "how different are you since you started blogging?" and since it really is my Blogaversary, I thought it might fun to take a look back at the blog and how far I've come! I wear my winter miles like a badge of honor. Snow? I'm out there. Polar vortex? The cold never bothered me anyways. Ice kind of scares me--I had an encounter with black ice this week that scared the cr*p out of me. But overall, I'm outside, putting in the miles and avoiding the treadmill as much as possible. On Saturday, the sun came out and the temperatures skyrocketed to the 60s. When you make plans to run with blogger friends, conditions must be perfect. Wouldn't it be great if that was how things really worked? For this January weekend, Mother Nature gave us her very best effort. How many of us runners struggle with nutrition? I know I do. Over the years, I've made adjustments in my diet based on experiences--good and bad--while training for endurance events. I think I've found what works for me, but could I be doing things differently? Probably. There doesn't seem to be a lot of agreement on what is the perfect balance of carbs, proteins, and fats needed to sustain an endurance athlete. 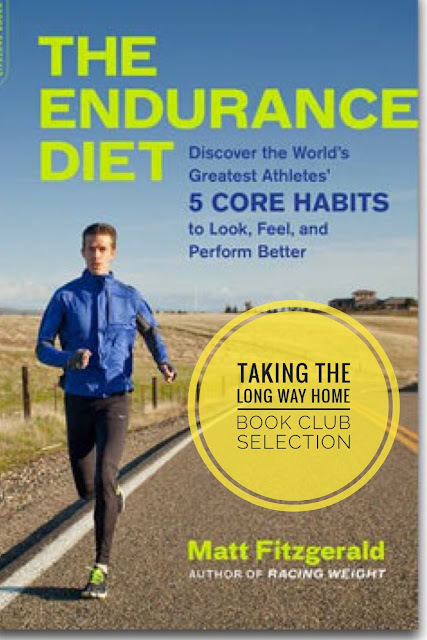 In his new book: The Endurance Diet: Discover the 5 Core Habits of the World’s Greatest Athletes to Look, Feel, and Perform Better , running expert and sports nutritionist Matt Fitzgerald shares the research behind the diet that he says fuels the majority of the world's elite athletes. Yesterday, I had one of those runs. Of course, this post isn't actually about the run. Because running gives us so much more than just a run. You know that run. This was a good one. My pacing was on point, my effort was easy, and I felt like I could go forever. That's how this run felt. For the first time since my diagnosis with RA, I felt like myself again. I'm sure the relatively warmer temperatures (40F) helped too. As I neared the final half mile of my planned 10k run, I was lost in thought. Almost done, I was contemplating the day ahead. Suddenly, my legs started to fly out from under me. Ice! With the warmer temperatures and the overnight rains, the roads were wet. There were a lot of puddles, but I hadn't seen any ice. Until now. I was running downhill and in that brief moment, my feet were moving faster than the rest of me. It happened so fast. There wasn't time to panic. Instead of fighting the slide, I let it happen. I prayed. I shuffled my feet. I pumped my arms. The icy patch felt like a marathon. Miraculously, I stayed upright. When I got to the bottom of the hill and the end of that ice, when I realized I was safe and on pavement, I slowed my pace to let my heart calm down. This week was full of ups and downs for me, emotionally. The newness of being diagnosed with RA has worn off, and frustration with still having symptoms is settling in. I was really optimistic when I started on my medications--hoping that I'd be symptom-free by now. I had no idea what an RA flare was all about. I also didn't realize how tired I'd be. A few weeks ago, I asked for a small reduction in my hours at work. This week, I was granted that schedule change but it didn't come without a struggle. That too wore me down. Running was the one positive spot this week. My runs went well. My legs felt fresh and light, and the miles passed without a problem. Maybe slowing down isn't going to be such a bad thing after all? Did you know that I ran the Big Sur Marathon last year? I hardly ever miss a chance to mention that I fulfilled a dream when I crossed that finish line! But today's Friday Five 2.0 topic got me thinking. What's left for a runner after she does her dream race? Well, I've been thinking about this a lot. Since running from here on out is all about fun for me, I've picked 5 races that I want to add to the bucket list. By the way, did you know the term "bucket list" comes from the saying "kicked the bucket"? As in, things you want to do before you die. I'm not planning on crossing over to the other world anytime soon, so I figure I've got a few years to knock some of these races off the list. The races I'm eyeballing are all in the US. Why Run if You Hate to Run? I receive fitness and running articles from the New York Times on a regular basis. Recently this article by Jen Miller appeared in my inbox: What if I Hate Running? This struck me as kind of odd. Why would you run if you hated running? Why does this article even need to be written? There are so many other activities you can do to stay fit--why do one that isn't enjoyable to you? It's been a cold one here at the old TTLWH headquarters. Every morning, I vowed to run on my old ancient treadmill, but once I saw the sun starting to rise, I bundled up and headed outside into the polar vortex for my runs. Every damn time this week. Because the sun makes me feel warm, even on the coldest mornings. It's been a good week of running! I'm starting off the new year with a new coffee cup, thanks to Shutterfly and my #holottafun memories. This mug puts a smile on my face with every sip of coffee. Do you have a favorite mug? What kind of coffee do you like? Cream and sugar? Or straight up black? Mine has chocolate soy milk. The mug is warm in my hand. Let's talk. Pour yourself a cup, get comfy. It's time for the Ultimate Coffee Date with our hosts Coco and Deborah! I'm shifting gears for this post--no running talk and no arthritis talk! Because...coffee talk! What would you tell me? What's new in your world? One month ago, if you had asked me what I had planned for 2017, I would have told you that I had a marathon and a half marathon already on the calendar. That I had already talked to Becky about my marathon training plan. I wanted a similar plan to my 2014 Chicago plan, with twice weekly sessions including CrossFit intervals and strength training. Before we embarked on my marathon training plan, Becky had a strength cycle planned for me for January and February. Everything was going to fall into place. I even confided in Marcia my super secret goal. I swore her to secrecy. I'm going to share it here because it's unlikely to happen: I had hoped to BQ at this year's marathon. I turn 55 this year, and my BQ time is now 4:10. My marathon PR from 2014 was 4:17. A 4:10 was totally within reach for me, if all the stars aligned and everything fell into place. As Marcia told me, I could do it if I learned to "find my gears" and hold back on my pace at the start of the race. In the blink of an eye, all that has changed. I've done a lot of soul-searching over the past 3 weeks. I'm still planning on running those races, but no longer am I reaching for the stars. Wow. Can you believe it's the start of the new year? 2016 was a tumultuous year for many of us. You probably know how my year ended. I'm looking forward to the fresh start that the new year promises. But it wouldn't be the new year without the yearly rewind! 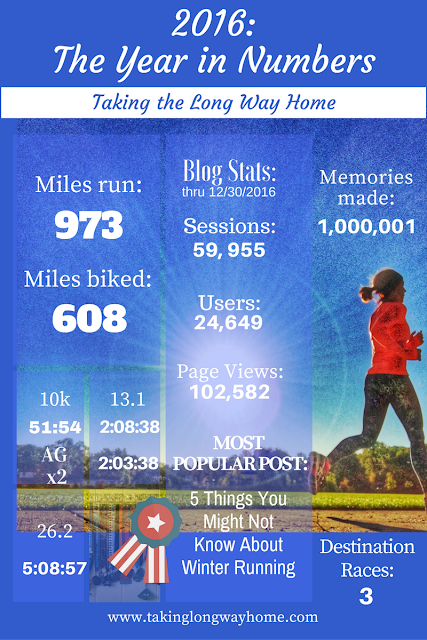 Because this is a running blog, I'm going to rewind my year in running! I've already recapped my year in bling. Today's post is all about the numbers. I'm also going to review the goals I set a year ago at this time. On Wednesday, I'll share my goals for 2017. I was fairly surprised when I added up my miles for the year! So close to my yearly goal of hitting 1000 miles! That made me super happy. How did I do with the rest of my goals?